Startups, Funding & The American Dream | Guest Post: Farima Nojoumi Mo Love for Movember! contact [a] nima.co Nima.Co is getting a facelift. Hang tight! 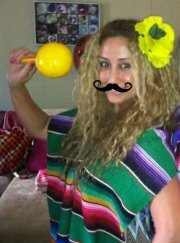 Guest Post: Farima Nojoumi Mo Love for Movember! Today’s guest post is from my favorite person, best friend and sister, Farima Nojoumi. Over the years she has inspired me to better myself more than any one person I can think of. With out further ado please give Farima a warm welcome. It’s Mo fun than ever to rock a stache for a good cause! During November each year, the Movember campaign has a cool, fun and creative approach of connecting people to a global movement. Movember empowers thousands of men around the world to grow moustaches aka Mo’s to help raise awareness and funds for men’s health, specifically prostate cancer and other cancers that affect men. Once registered at Movember.com, these men aka Mo Bros grow their Mo’s from the 1st of the month to educate others as “walking, talking billboards for 30 days.” Pretty awesome. I recently registered and am dedicated to changing the face of men’s health one Mo donation at a time. I think Anthony J. D’Angelo said it best, “The most important things in life are not things.” Simply put, I care about the men in my life and yours. As a Mo Sista, I encourage you to support the Movember community because every dollar donated will help find a cure to cancer and save real lives. Domainers can utilize their network and portfolio of domains to have a huge impact on the world by using websites as a catapult for good causes. This month we would like you to support Farima’s Mo space and we hope you use your domains to help a good cause too! Thanks for the inspiration Ricky Bartleman. Die hard entrepreneur, startup adviser, world traveler, blogger, inbound marketing addict and evangelist of the American Dream. Helping people is my passion, business is my vehicle. Great article! I’m glad to have a “domainer” website that isn’t only driven by money. I hope next Movember to see a pic of Nima with a huge Mo-stache! P.S. I added a pic of Dawn and I with our Mo-Staches! I’m a little bias, but I’m definitely a Farima fan! I love and support you with all I got. Keep using your skills to raise awareness to good causes and keep inspiring others to do the same. This is the first year I have heard of movember, I think this is a great project and fundraiser. I am very proud that my niece is stepping up and helping organise and gain exposure for this great cause. Keep up the great work Nima! This is a fantastic article! A great campaign to put what’s really important into perspective. Good luck with all your fundraising and I’ll definitely make a donation to the Mo cause and share this with all my family and friends. Great job (as always) Farima!! Damn girl you a Mo-nster! Great article! Rock a mustache for a great cause this Movember! Farima, you are truly in inspiration to us all. Not only can you rock a Mo, but you have found so many unique ways to contribute to this cause. Farima, keep up the good work your doing and and i know you’ll get Mo-support than you thought. Farima you are the best baby, this is a great cause and I’m sure all the men out there they appreciate all your support to raise money & awareness for saving the lives of our Farther’s,Brother’s, Husband’s, Son’s & friends. Thank you for all your hard work!! You always ROCKING MO SISTA!! My pirate stache at Halloween! Show your support for Movember!!!!! SUPER awesome article! I love the MOvember and will happily rock my dirty stash, even in the ocean! =] Keep up the hard work Nojoumi fam! How much you wanna bet I can throw a football over the whole month of Movember! haha! Napolean, at Nima.Co, we use the buddy system. No more flying solo. You need somebody watching your back at all times. Second off, you’re gonna learn to discipline your image. You think I got where I am today because I dressed like Peter Pan over here? Great lookin’ out for us men baby! See you Saturday at Bru Haus. My stache is coming in real nice and creepy. Fareem, Sis, You are the only female I know taking the time to look out for us guys. One of the many things that sets you apart and makes you A Mo mazing. Or Spec-stache-ular You truly are the best Wingman. Love you, I’m disappointed shad didn’t put up a picture of his glorious stache. So I found one of Freddie Mercury, which could pass for him. Cee! Freddie Mercury!?! haha If Wade was in this convo he’d say Shad looks more like the guy in the first pic below. I’m surprised you didn’t upload your stache-tastic pic…so I uploaded your look-alike, too. Keep up the great work Farima and Nima! Farima, Im with you 100%… You have done an awesome job at supporting us men. I was with my dad earlier and he was telling me about his good friend that just passed away from prostate cancer. I told him what you are doing and big Joe gave u the stamp of approval and sends his gratitude/support! Keep it up! Farima joon Im so proud of you and what you have done for the men with Movember! I hope tomorrow is more then amazing for you! ITs great how your supporting the MEN! i love you lotts!